The Ewing Collection was donated to the University of Melbourne in 1938 and complements the Russell and Mab Grimwade ‘Miegunyah’ Collection through its focus on the later 19th century. Dr Samuel Arthur Ewing (1864–1941) was a qualified pharmaceutical chemist, surgeon and University of Melbourne alumnus, as well collector and art patron The collection’s significance lies both in the quality of the artworks and in its status as the first art collection gifted to the University (following the donation, in 1881, of one portrait of Chancellor Sir Redmond Barry). Dr Ewing collected with the understanding that art has an educational function and a role to play in developing a sense of nationalism – an ethos influenced by the era in which he began collecting, the decade after Federation. 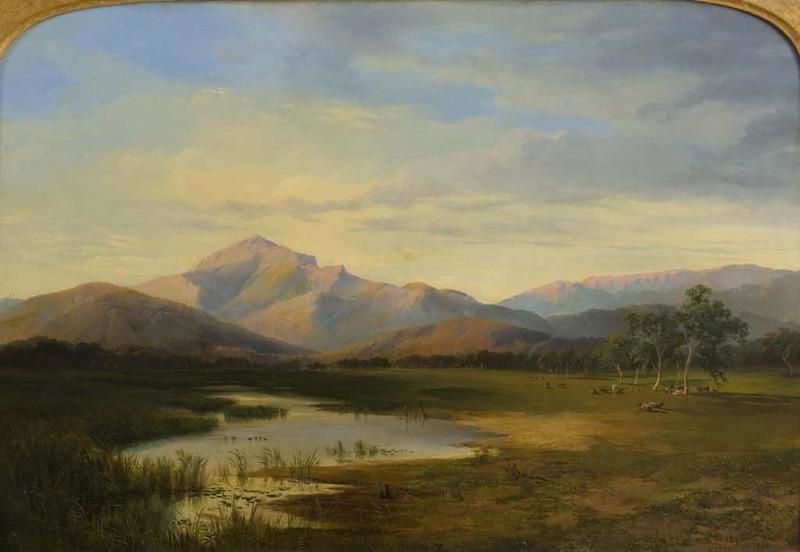 The focus of the collection on landscape painting reflects his belief that encouraging a contemplation of the Australian countryside could not help but inspire a love of country. Dr Ewing collected widely and his collection included 17th-century Persian ceramics, 18th and 19th-century British ceramics and a book collection comprising over 2000 volumes. His ceramics collection was gifted to the National Gallery of Victoria, his book collection was gifted to the Presbyterian Ladies College and his landscape painting collection was gifted to the University of Melbourne. This gift comprises 59 paintings and watercolours (plus three prints and one sculpture) by Australian artists spanning the period from 1862 to 1940. Artists include Nicholas Chevalier, Louis Buvelot, Arthur Streeton, Frederick McCubbin, Rupert Bunny, David Davies, Arthur Loureiro, E. Phillips Fox, Bernard Hall, Hans Heysen and Max Meldrum, as well as leading artists of the watercolour movement such as Harold Herbert and J.J. Hilder. Dr Ewing was a member of the Savage Club. His collecting was influenced by the many artists who were fellow club members, as well as by his acquaintance with Bernard Hall, Director of the National Gallery of Victoria from 1892 to 1934. This collection is a closed collection; however, it provides a strong foundation for further acquisitions with the aim of improving the University of Melbourne Art Collection’s broader holdings of 19th-century art.